The season’s biggest game, a near capacity crowd, and a television audience added up to the perfect setting for Eagle Rock High School’s Judith Espinoza. 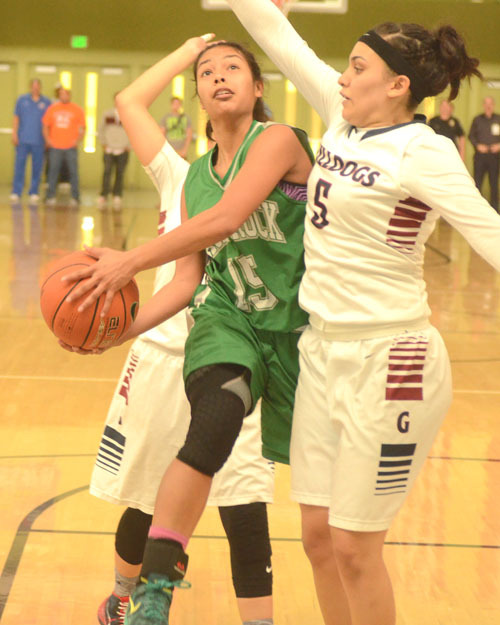 She dominated the scene by scoring 39 points to lead Eagle Rock to a 60-51 victory over top-seeded Garfield Saturday in the girls’ basketball City Section Division III championship game at Roybal Learning Center. Espinoza made 14 of 24 shots with six 3-pointers and five of seven free throws in what turned out to be dual Green-and-White Championships for Eagle Rock when the boys’ team defeated Hamilton, 68-56 to capture Eagle Rock’s second City Division III title of the day. Espinoza drew chants of “MVP” in the girls’ game when she drove the lane for a basket or swished a 3-pointer. Espinoza scored 33 points in the 2013 finals, but they weren’t enough to lead her team to victory against Reseda. They finished the deal this year to win the girls’ first City basketball title. The “MVP” chants were just as loud later that day for Eagle Rock’s Stewart Ramirez who delivered an equally scintillating performance for the boys’ team. The 6-4 senior forward poured in 35 points and had 11 rebounds to lead the second-seeded Eagles to the boys’ championship for the first time in the school’s 87-year history. In the girls’ game, Garfield, after leading for most of the first half, led 24-23 at halftime. Espinoza took over the game in the second, scoring the first 13 points of the third quarter. She finished the 8-minute stanza with 18 points, including four 3-pointers, to put Eagle Rock ahead 44-34. Sophomore center Monica Garcia scored 17 points and grabbed 14 rebounds and senior forward Irma Munoz had 16 points and five rebounds to lead Garfield. Eagle Rock’s Diana Flores converted seven to 10 free throws and was credited with 12 rebounds. Florence Lucey recorded 11 rebounds. Eagle Rock (25-9) and Garfield (23-12) begin the State Southern Regional playoffs this week. The Eagle Rock boys opened their game with a big run led by Ramirez and needed another big run in the second half to defeat Hamilton. 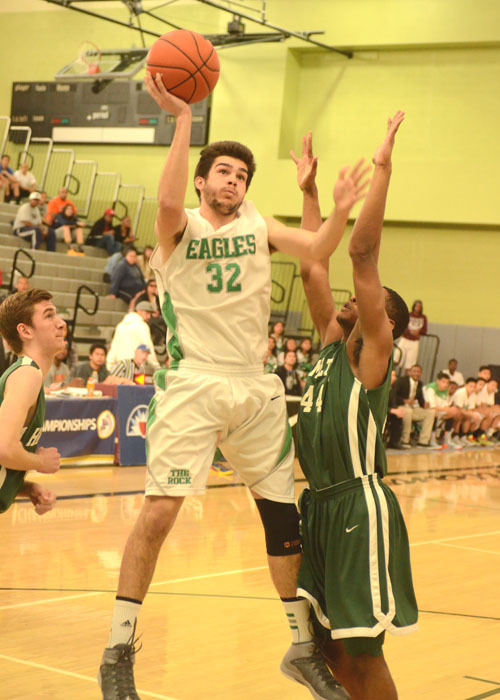 Drives to the basket by Ramirez for 12 points helped the Eagles to an 18-3 lead to start the game. Hamilton overcame its bad start and went ahead, 42-41 in the third quarter, but the Yankees’ comeback hopes were quickly dashed as the Eagles soared back ahead with a 15-2 run. With his team up by six with just under a minute to play in the game, Ramirez made three free throws during chants of “MVP” to prevent Hamilton from getting any closer. Paul Gandara was a key contributor for Eagle Rock. He scored 11 points and had 11 rebounds and five assists. Chaevon Gaines also had 11 points and four rebounds. The Eagles (22-12) run to the City title opened with a 2-7 start to what appeared to be another disappointing season. Eagle Rock, which is above the .500 mark for the first time since 2007-08, regrouped and won the Northern League title. In the playoffs, Coach Christian Dunbar guided his teams to victories over Locke, King Drew and Grant to reach the finals. Eagle Rock and Hamilton (11-19) advance to the State Southern California Regionals this week. March 13, 2014 Copyright © 2012 Eastern Group Publications, Inc.